Description: Children will love this working phonograph made to look like an adult's stereo system. It has a smoke-tinted transparent plastic dust cover over the turntable. Phonograph has an automatic cueing system that gently lowers the tone arm onto the record when the dust cover is closed, and lifts the tone arm up when the dust cover is opened. Also has an automatic On/Off system that automatically turns off when the tone arm reaches the end of a record. Plays both 33 and 45 RPM records. Designed for children ages 8 years and older. 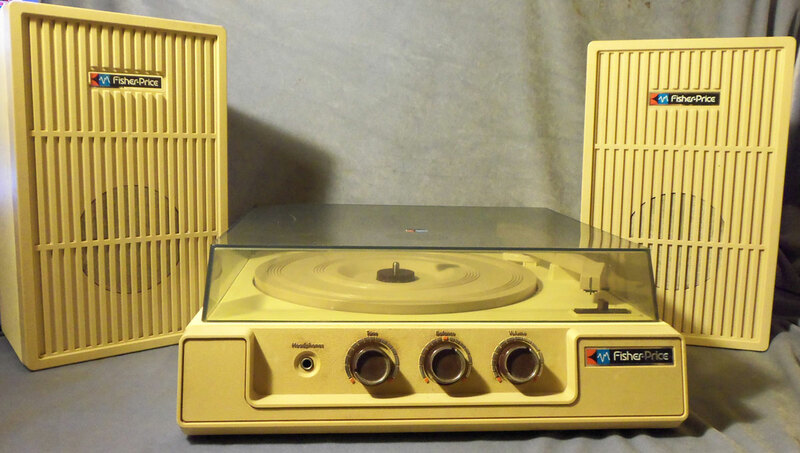 FPT13200 - Tan electric record player with a hinged smoke-tinted transparent plastic dust cover lid. 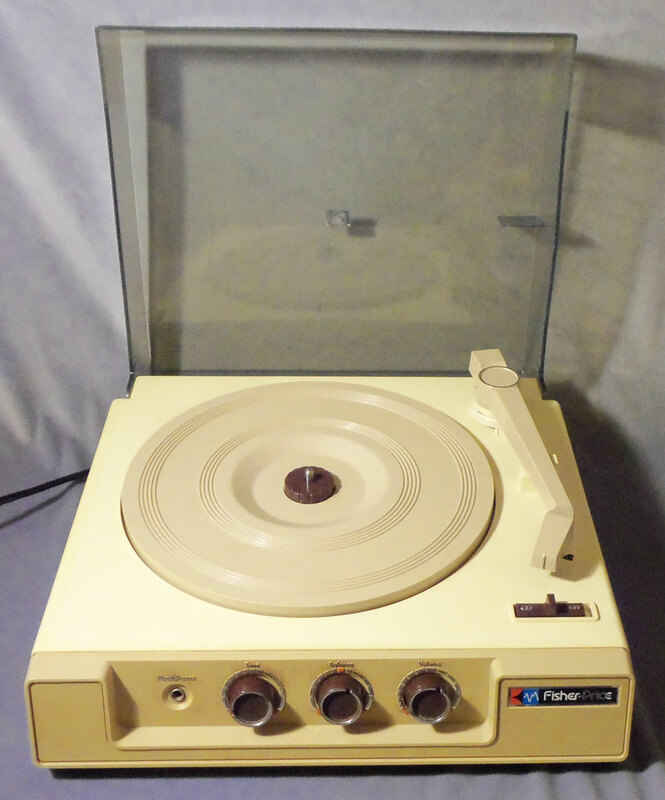 The player has a beige turntable and needle arm, a sliding button to switch from 33 to 45 RPM, 3 control knobs on the front, and a headphone adapter on the front. Measures 15-1/4" wide, 14-1/2" deep, 5" tall. 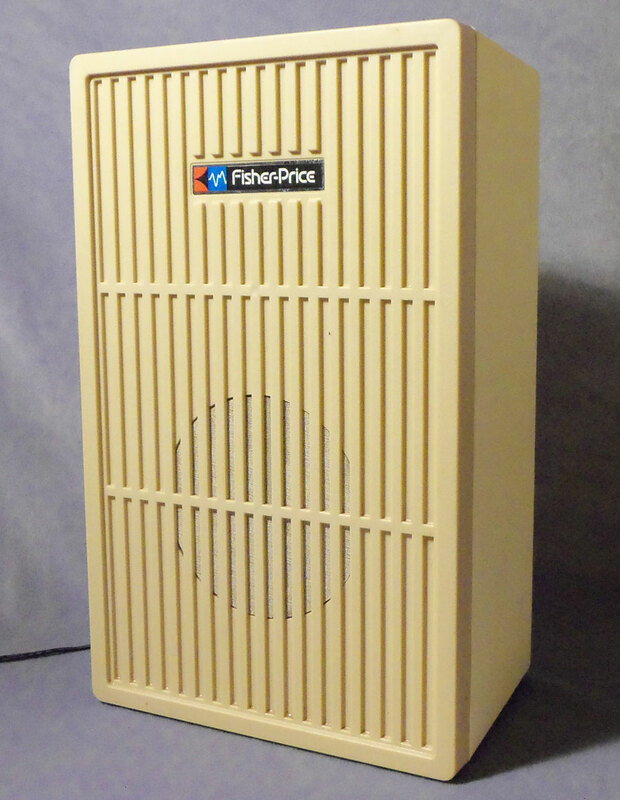 2 each - FPT13201 - Tan acoustic suspension speaker cabinets with 5-inch speakers. Has an integral speaker cable with a mini-RCA plug on the end. 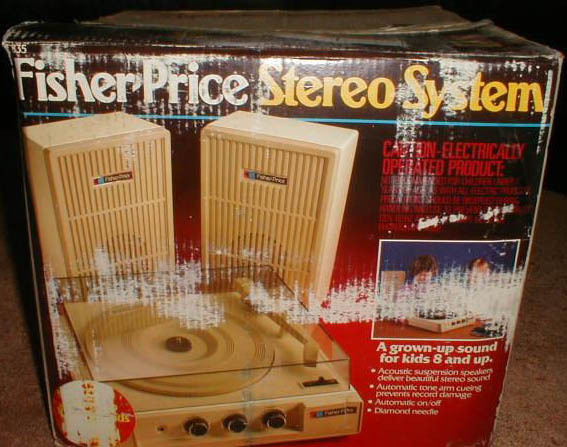 Both of the speakers are marked "Fisher-Price". Measures 8" wide, 5" deep, 11-7/8" tall. Has a 10 foot long black (with white dotten tracer stripe) wire. Repair: If your music box plays slow (or not at all! ), you may want to check out our REPAIR STATION. We can restore most Fisher-Price wind-up music box mechanisms to almost new condition! FPT13202 - This set was sold in a 18-3/8" long, 16-5/8" high, 17-1/4" deep box. The 1983 dealer's catalogue shows this Stereo System in black and grey colors oppose to tan. Apparently, the black and grey version was merely a prototype and was never mass produced. Also see 1978-1989's #825 Phonograph. Replacement needles for this phonograph are available at This Old Toy's Toy Store.